Choose an eyeshadow duo. A highlighter to accentuate the curved, a dark shadow to intensify the depth of the look. you should have at least two colors to make up your eyelids. Gradually, as you gain the confidence you can increase the number of colors. Ask the highlighter on the whole eyelid (upper and mobile) by emphasizing the inner corner of the eye and under the eyebrow to get a nice domed arcade. Remove the dark shadow on the outer corner of the eye and degrade gradually inward. This may sound a bit complicated but rest assured, you will master the technique very quickly! Work the "banana", that is to say the hollow of the eye, making small back and forth with a brush and a little ball of dark shadow. And now, voila! Moisturize your eyes well (with your day cream or eye) before asking your eye, it will hold better. Your eyes are almond shaped, somewhat closed: work outside of the eye to enlarge your eyes. Instead you eyes wide open: work to reduce your inside look. Do not put too much material on your brush. Of course you can always fade with the finger but better start with small buttons and return if necessary rather than depositing a quantity which you will not get rid of. You do not know how you stop and you feel that you have made up for a masquerade? 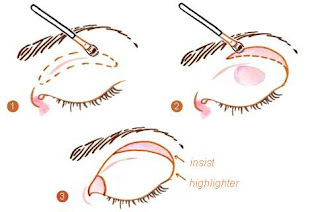 To avoid such mishaps, ask your brush between the ala and the outer corner of the eye. You get a line that corresponds to the balance of your face. This is the line that must be followed to put your eye. The lids are made, you must now make up your eyelashes to your mascara!